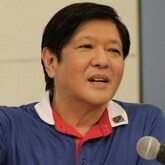 MANILA - The camp of Senator Ferdinand Bongbong Marcos has issued an urgent request to the Commission on Elections and the PPCRV to terminate the unofficial count immediately, with claims that ''dagdag-bawas'' or vote padding-shaving is being committed in the vice presidential race. Lawyer Jonathan Dela Cruz, legal counsel of Marcos, said that the supposed irregularity in the canvassing of polls started in the late hours of Monday night. "It is unfortunate that while the whole country was asleep the glitch in the canvassing occurred and from then on we saw a progression of so-called 'updates' that showed an alarming and suspicious trend reducing our lead contrary to the results of independent exit polls and our own internal surveys," Dela Cruz said in a statement. "In the past, the unofficial count was designed not to be completed to avoid the possibility of confusion and conflict with the official one. There is no reason for this not to be the norm this time around," he added. He claimed that although "we are certain that if the unofficial count continues we will emerge victorious," the Marcos camp does not want "the official canvass to be conducted by the National Board of Canvassers (NBOC) pre-empted by the unofficial count." The partial and unofficially tally of votes from PPCRV on Monday night initially showed Marcos having a commanding lead of close to one million votes over Robredo. But around 10 p.m., Robredo began inching closer to Marcos' numbers and eventually overtook him in the race shortly before 5 a.m. Tuesday. With 91.92 percent of the votes counted as of 2:30 p.m. Tuesday, Robredo sustained her lead of 100,000 votes over Marcos. Partial and unofficial election results from the PPCRV showed Robredo with 13,498,198 votes and Marcos with 13,307,484 votes. The Marcos camp, however, maintained that Robredo's rise is contrary to their independent exit polls and internal surveys. Robredo, on her part, refuted the claim of the Marcos camp, saying that any cheating attempt is virtually impossible in the automated polls. "Parang napakahirap naman atang mandaya na halos wala nang human intervnetion iyung pagboto. Pangalawa, lahat po kaming mga kandidato, may watcher sa mga presinto," she said. What keeps Leni, Bongbong neck and neck?